It may now be the area’s prime source of Christmas trees, but the famous Chopwell Wood overlooking the Derwent Valley has had a good few more uses over the years – and, dare I say it, rather more important ones, too. The little patch of green in question has been there for a very long time indeed, once forming part of the original Wild-Wood which blanketed most of Britain in ancient times. It has, however, not changed a great deal size-wise since the days of the Romans. Most notably, timber taken from Chopwell Wood has been used to build several important ships over the centuries. The first recorded use of this type was in 1294 when wood was gathered for a galley ship being built at Newcastle for King Edward I’s navy. And then, in 1635, King Charles I tapped the wood for timber for the construction of his fanciful Sovereign of the Seas – his new flagship, which included more than 2,000 oak trees from Chopwell (as well as other woods, too). The tax levied by the monarch to build this showcase ship was one of the major causes of the English Civil War. Castle builders have also made use of Chopwell Wood’s resources. In 1538, timber for Dunstanburgh Castle’s new roof and floor were sourced there – and soon afterwards Bamburgh’s roofers put out a similar call. In 1593, the constructors of Berwick’s new pier put in an order for 40 tons; and more than twice that was later sent to Norham Castle for general repairs. Berwick was back again in 1620 with a request for 250 tons of timber for bridge work. It is also known that Newcastle’s old Tyne Bridge, in need of urgent post-Civil War repairs, was patched up with Chopwell timber in 1647. The Napoleonic Wars brought demand for timber to something of a crisis point, too – with Chopwell Wood being reduced to a few hundred specimens come 1820. After that, more careful management of the wood secured its future. In the 20th century it was used for the training of foresters; and pine grown there was used for pit props down the mines. World War II saw demand for timber rise again, and the wood was heavily utilised. The Forestry Commission’s North-East base was stationed there from 1923 to 1947, and a District office replaced it in 1955. Since then it has been used increasingly for recreational purposes. Quite apart from all of this, Chopwell Wood has been regularly plundered for the construction and repair of dwellings, bridges and the like by the locals. And Christmas trees, of course. Rowlands Gill, now a town of some substance in the Derwent Valley, was, until around a century or so ago, little more than an open expanse of countryside with a building or two surrounding the railway station established there in the 1860s. As you might expect, its name came from a rivulet which ran through the area before dropping into the Derwent – but who exactly was the ‘Rowland’ in question? The answer is that, well, no one knows. Not for sure, anyway. For, new though the former village and present-day town may be, the name of the little beck seems to go back quite some time – to at least the early 1700s. So no wonder we’re having trouble pinning down the original Rowland. An 1896 history of the area (History of the Parish of Ryton by William Bourn) states that Rowlands Gill (once a part of Ryton parish) derived its name from a 17th century landowner, Robert Rowland. However, a recent archival discovery and subsequent research* indicate otherwise. This tells us that the earliest reference to the name of the stream in these parts dates to 1728 and a ‘Rowland Richardsons Gill’ – and there is no evidence of a landowner by the name of Robert Rowland to be found. That, however, is about as far as we can go – with any degree of certainty, anyway. The aforementioned research has brought us three possibilities as to the precise identity of this mysterious Rowland Richardson, but we cannot say for sure which is our man. There were certainly Richardson landowners in the vicinity at the right time, but there are several Rowlands among folk who bear this name. The three so far unearthed were plucked from the Ryton parish registers of the 17th century. Hannah Greener, a 15 year-old girl from Winlaton, can claim for both herself and her home town a most undesirable of medical firsts. For this unfortunate young lady was the first person in the world to die after having received a chloroform anaesthetic – for the removal, would you believe, of a toenail. At the time of her death in January 1848, chloroform was new to the scene as regards anaesthetics – previously, ether would have been the norm. In fact, when Miss Greener stepped forward somewhat gingerly with her seriously in-growing toenails, it was precisely during this ‘changeover period’. In late 1847, ether was used on her to remove the nail of her left big toe (at Newcastle Infirmary); then a few weeks later she was back under the knife – this time at her home in Winlaton – to have the less serious right big toenail detached. And so Dr Meggison and Dr Lloyd set about the operation. A teaspoon of chloroform was poured onto a handkerchief which was then held to her mouth. An incision was made, and she flinched – so a little more chloroform was administered. The patient then turned a funny colour, spluttered and expired. All attempts at resuscitation failed – the whole process taking little more than two minutes. The resultant inquest (at the New Inn, Winlaton), concluded that death had most probably been caused by congestion of the lungs – a known side effect of the use of chloroform. The doctors were thus exonerated and young Hannah Greener was laid to rest in Winlaton churchyard. In 1911, however, medical experiments suggested that the death was most probably due to fatal cardiac arrhythmia (ventricular fibrillation). This would place the point of death at the moment the incision was made, which would have caused a fatal hormonal surge to the chloroform-affected heart. Debate over which was the best and safest anaesthetic on the market raged for many years after Hannah Greener’s death. Chloroform was very popular in many countries for a very long time, though – until the discovery of barbiturate-based concoctions in the 1940s. More information on the Hannah Greener case can be found here and here. If you studied Italian unification at school, then you’ll know all about Giuseppe Garibaldi, the famous general and politician who had rather a lot to do with the creation of the present-day Mediterranean state. But his fame extended well beyond the borders of his own corner of the world – and he was especially popular on Tyneside. The enthusiasm among the North-East’s working classes for Garibaldi was largely down to Blaydon’s very own Joseph Cowen Jnr, the industrialist and Radical politician who was very prominent in Tyneside affairs in the Victorian era. He championed the cause of many a European revolutionary movement, and entertained several prominent figures from the continent at his home, Stella Hall, in Blaydon (now demolished). And, in 1854, it was Giuseppe’s turn to answer Cowen’s call. As it happened, Garibaldi was in the middle of his travels anyway, and needed to pop into the Tyne to pick up some coal. As for his North-East stay, he arrived on 21st March 1854 and left in late April. Spending most of his time in Tynemouth, he popped up river to Blaydon at the behest of Cowen for a very brief sojourn. Whipping the locals up into a frenzy, the eager host eked every last bit of positive propaganda out of the visit – with memories of the occasion surviving comfortably into the modern era. Anyway, Cowen gave his guest ‘the tour’, presented him with a gift or two, then off he went back to Italy where he eventually carried through with his unification process during the 1850s and 60s. Back in Blighty, Cowen mused over the experience for a few years, before eventually erecting a statue of the great man in the grounds of his Stella Hall estate. It was created by sculptor George Burn and erected in 1868 a little to the north of the present-day remains of the ‘Summerhouse’ which still overlooks Blaydon. Cowen died in 1900, and very soon afterwards the statue disappeared. Fingers were pointed at Cowen employees, who had had to pay a penny towards its construction; but a more likely story is that it was sent into the undergrowth at the base of the hill by playful youths. 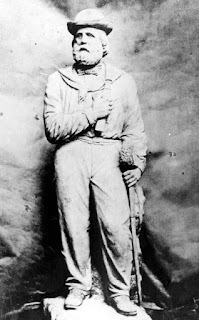 Shattered into several pieces, all but the head were then lost forever – with Garibaldi’s bearded bonce finding its way into a builder’s garden by the 1940s, then eventually, in 1977, into a glass case in Blaydon Library. It’s still there today. Garibaldi made a second visit to the UK in 1864, but the somewhat nervous authorities sent him packing almost immediately – and before he could so much as contemplate a return to Tyneside. It may have been this rebuffal that prompted Cowen’s statue a few years later. The scene illustrated above will be instantly recognisable to most of a certain age – especially those with so much as a passing interest in movies. 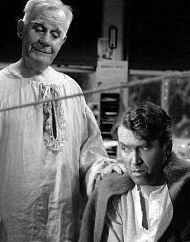 It is, of course, a still from the film It’s A Wonderful Life, featuring James Stewart (right) and his guardian angel, Clarence Odbody, played by Henry Travers. And what hardly anyone knows about the latter is that Mr Travers was born on the banks of the Tyne at Prudhoe in 1874. There is much confusion over the origins of our Henry, though, with biographies having him born in various places. He spent many years in Berwick, so most claim he was born there; others say Ireland. But his birth was certainly registered in Hexham registration district (which, in 1874, included Prudhoe), so that would seem to clinch it for the good folk of our Tynedale town. He was born ‘Travers John Heagerty’, but would barely have known the place of his birth. At a very early age (around 2) his family moved to the aforementioned Border town (Tweedmouth, actually), and he spent his childhood there, before training as an architect. He enjoyed amateur musical/dramatical roles from the 1890s onwards, briefly visiting Broadway in 1901. He returned to England thereafter to enjoy many successful years on the stage. In 1917, he returned to the States, where he trod the boards prolifically for the next two decades on Broadway. In 1933, he appeared in his first movie, Reunion in Vienna; and in the years that followed cornered the market in roles very similar to that for which, ultimately, he would be best remembered: bumbling but loveable old men. His career seemed to peak in 1942 when he was nominated for an Oscar in Mrs Miniver. He retired in 1949 and died in 1965, aged 91.